The World Famous 3 min. Game! 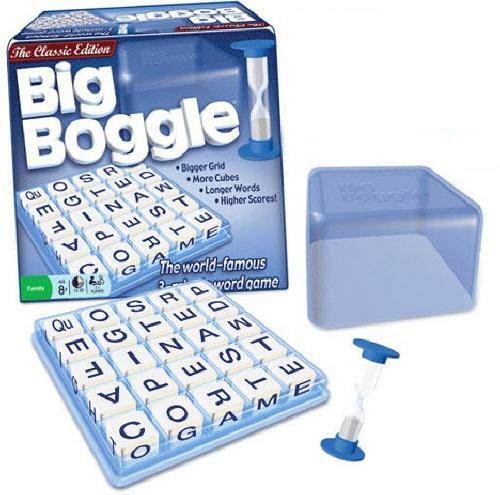 Big Boggle has been enjoyed for more than 30 years! Shake up the 25 letter cubes and try to spot as many words as you can. Race against the 3-minute timer as you follow adjoining letters, every which way, searching for words that you hope your opponents won't find. When time runs out, players compare their lists and score for each unique word they've found. The player with the highest score wins Big Boggle! The larger 5x5 grid puts nine more letters in play than standard Boggle. Advanced, team and handicap variants are included. The "Double Letter" cube features the six most important 2-letter combinations in the English language, making it easier to form valuable 5 and 6 letter words, and even longer ones!